BabyFood101 was founded by parents who care about food. Feeling overwhelmed by parenting - hey, we don't have to tell you about sleepless nights - we designed an easier way to feed our new eaters that is both nutritionally sound and fun. Most importantly, we didn't have to cook 2 separate meals (one for baby and one for ourselves). We simply cook healthy food for ourselves and give some to our growing baby. We feel that the best way to get your child to eat healthily is to model healthy eating. Becoming parents forced us to rethink what we eat and make some healthier choices for ourselves. Our transition from take-out to home cooking has helped us feel better and we believe do a better job parenting. 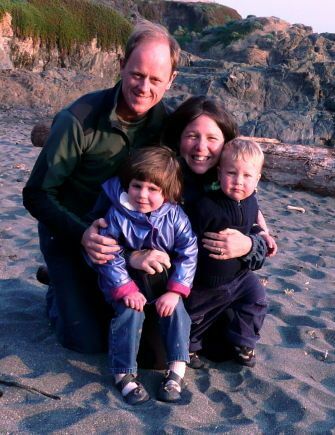 Lisa Cain, PhD, is a biologist who loves watching her kids eat - but isn't a 3 star chef. When she started feeding her first child solids she quickly realized that take-out every night was no longer feasible. She was disappointed with the current baby food books and websites and decided to come up with her own plan to easily incorporate her new eater with her family. She has researched the latest from nutritionists, childcare experts, and chefs to bring you the most up-to-date and useful information on feeding your baby. Matt Cain is a devoted father and eater and quite a good home chef. He has been building popular web sites since 1996. Originally from Melbourne, Australia, he is now happily living in San Francisco, CA. Matt's interests include taking the kids to the park or beach, hiking, biking and photography.